Our award-winning prenatal multivitamin for expectant mothers supports mom and baby’s development before and throughout pregnancy. * Feel nourished and confident with New Chapter. What is Perfect Prenatal Multivitamin? It’s recommended to begin taking a prenatal vitamin as one of your first steps in pregnancy planning, to make sure you’re getting essential vitamins and minerals. We blend these with whole-food fermented vitamins and herbs to create the Perfect Prenatal Multivitamin for both mom and baby. What does Perfect Prenatal Multivitamin do? When you’re pregnant or planning to be, you’re naturally looking for the best organic prenatal vitamins. Nourishing yourself and your baby with the perfect ingredients matters for supporting a healthy pregnancy. But how do you choose between raw, fermented or USP multivitamins, or even prenatal gummy vitamins? For your peace of mind, there is no sugar added to New Chapter’s whole-food fermented prenatal vitamins. They’re made with organic, Non-GMO, high-quality & premium ingredients—from Folate to Iron to Vitamin D3 to supportive vegetables and herbs—to nourish the two of you every step of the way. 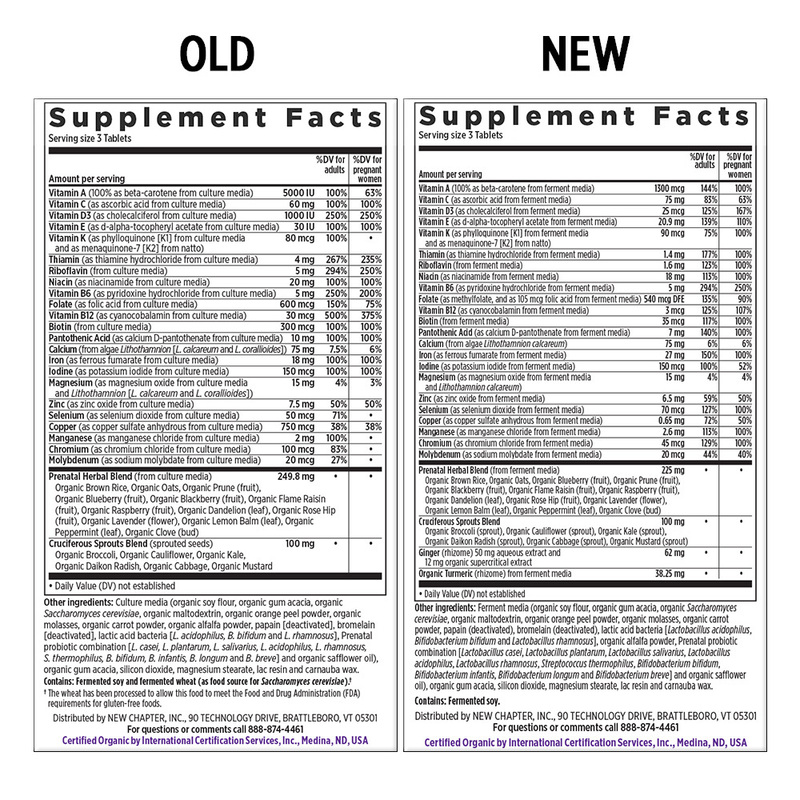 Building your supplement pantry? For prenatal DHA, add Wholemega™ for Moms fish oil, and Perfect Postnatal™ Multivitamin for postnatal support. Other ingredients: Ferment media (organic soy flour, organic gum acacia, organic Saccharomyces cerevisiae, organic maltodextrin, organic orange peel powder, organic molasses, organic carrot powder, papain (deactivated), bromelain (deactivated), lactic acid bacteria [Lactobacillus acidophilus, Bifidobacterium bifidum and Lactobacillus rhamnosus], organic alfalfa powder, Prenatal probiotic combination [Lactobacillus casei, Lactobacillus plantarum, Lactobacillus salivarius, Lactobacillus acidophilus, Lactobacillus rhamnosus, Streptococcus thermophilus, Bifidobacterium bifidum, Bifidobacterium infantis, Bifidobacterium longum and Bifidobacterium breve] and organic safflower oil), organic gum acacia, silicon dioxide, magnesium stearate, lac resin and carnauba wax. Caution: As with any dietary supplement, you should advise your healthcare professional of the use of this product. If you are taking medication, or are nursing, pregnant, or considering pregnancy, you should consult your healthcare professional prior to using this product. Discontinue use and contact your healthcare professional if you experience a side effect or an allergic reaction. Do not exceed suggested use. Keep out of reach of children. 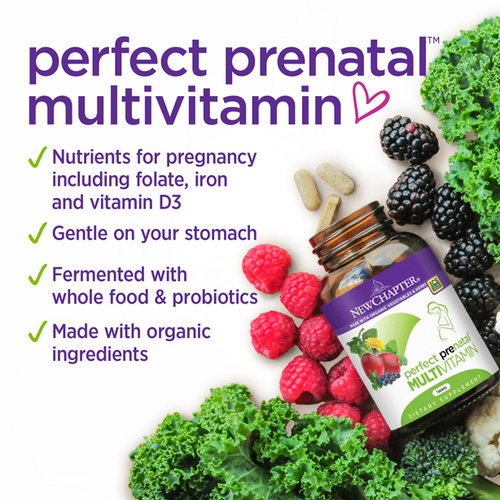 Perfect Prenatal Multivitamin is Gentle on Your Stomach! Our fermentation method makes all the difference. Our proven fermentation method uses the power of probiotics to bring greater vitality to nutrients and herbs, and makes them easily digestible.